RRJ: In regard to the path you’ve been on professionally, how does Jeremiah 29:11 speak to you? Jason: For the Christian, verses like Jeremiah 29:11 provide an unspeakable amount of comfort. Even if I didn’t necessarily know the next step in God’s plans for my life, the fact that He loves me enough to give me “hope and a future” gives me such a peace. My entire career path can be traced to a campus-wide email that I received 20 years ago as a college sophomore. And from then until now, every stop along the way has been a wonderful place to work: great bosses, hard-working co-workers, and office cultures that didn’t require your character to be compromised. Equally as important, any career transition that I’ve gone through has been on my own terms and has been a positive development. I can’t help but see God’s hand at work in my professional path. RRJ: You are a talented orator and gifted in building relationships. What opportunities has God placed in your life to be able to use your gifts? 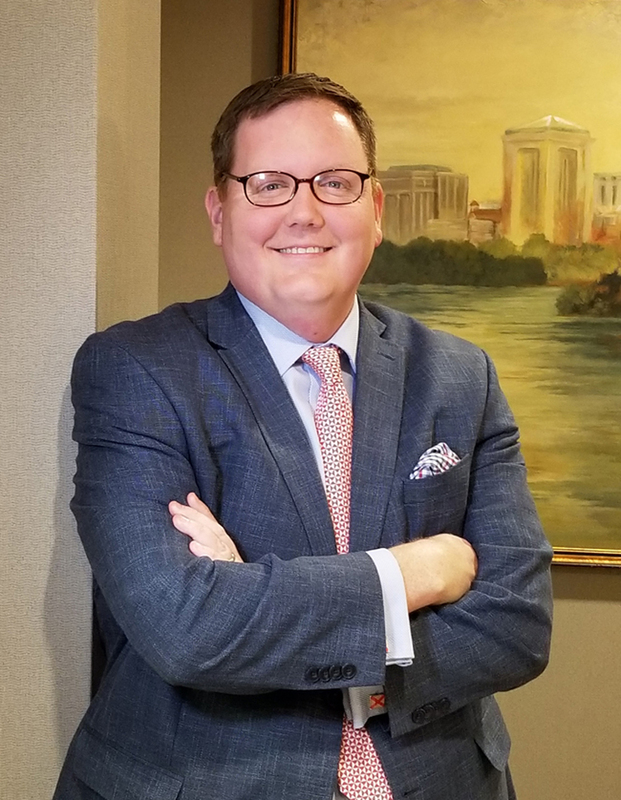 Jason: I’m blessed to serve on the board of directors of the agency my parents used when adopting me in 1980, Agape of Central Alabama, as well as my college alma mater, Faulkner University. There’s nothing in my life that doesn’t point back to one or both of those entities, so it’s incredibly humbling to now have a role in their futures. Music has been a part of my life for many years, and I’m thankful to have the opportunity to lead worship at my church. And I thoroughly enjoy public speaking, whether it’s emceeing charity events or serving as an announcer for sporting events. You don’t earn certificates or diplomas in “building relationships,” but I firmly believe it is an innate skillset that to some degree all of us have. I’m thankful that God has given me ample opportunities to use my talents, and hope He’ll continue to keep my eyes open for future chances, too. RRJ: Having been adopted at 3 months old, you must have a deeper understanding of how precious adoption is. Romans 8:14-17 speaks of us, believers in Christ, as adopted by God. Can you shed some light on how wonderful that news really is? Jason: There’s no such thing as an unwanted adoption. In any situation involving an adoption, you have a parent eager to give love and an adoptee eager to accept that love. No caveats. No exceptions. In the same way, a Christian is wanted. God the Father has chosen us, and we belong to Him. He pours out His love on us without limitation, our flaws notwithstanding. What could be better than that? RRJ: What do you feel is the most important part in sharing your faith with others? Jason: Authenticity. There’s not an aspect of our lives where we don’t come into contact with people who could use our help. Even at church. Our preacher routinely says, “There’s a heartache on every pew.” And he’s exactly right. Christ compels us to try and help the hurting, wherever they may be. But if that person believes you’re just “going through the motions” and don’t genuinely care about them, you’ll never be able to take the next step and form a solid relationship with them. RRJ: You mentioned that your wife, Kim, is your best friend. How do you encourage each other to be the best versions of yourselves? How important do you think it is for children to see their parents getting along in a loving relationship? Jason: My wife is genuinely my favorite person to be around. She’s funny and personable. And when she wants to light up a room, I’m thankful to have a front-row seat. There’s no one on Earth I want to impress more than Kim. Since we became parents, it’s always been important for us to be “on the same team” in front of the boys. And we’re very protective of each other when dealing with our children. But Maddox and Griffin will never, ever wonder if they grew up in a home where Mom and Dad loved each other and cared for each other. We work to say it and show it every day. Like everyone, Kim and I fail each other at times, but thankfully as Christians we know what grace and mercy look like and feel like. And we know the value of extending it to each other when we need it, even if we don’t deserve it. RRJ: In the Gospels, Jesus mentions how important it is for believers to have a child-like faith. How have you seen your childrens’ faith in action? Jason: Even at a young age, our boys have unfortunately dealt with several deaths, not only in our family but also at their school. It’s been such a faith-builder to see how they’ve reacted to those tragedies, especially when my grandmother passed away. Their words and thoughts during that heartbreak were as comforting to me as anyone’s. It’s also wonderful to see them interact with other children. Unlike adults, they look past race, age, socio-economic issues, handicaps – if you want to be their friend, they want to be your friend. Maddox and Griffin are such great examples to their parents; we’re blessed they’re ours. RRJ: What encouragement would you offer Journey readers who are struggling to live out their faith beyond church walls? Jason: Two things. First, don’t do it alone. Kim and I have a great group of friends who hold us up and keep us accountable. We constantly see how they are able to live out their faith at home, at work, in their families, and in the world. They’re such an encouragement to us, and I hope we are to them. So, if you’ve already got a core group of people in your life, don’t just make sure they know how you feel about them, make clear that you expect them to lean on you and that you expect to lean on them, too. It’s Solomon’s three-fold cord approach from Ecclesiastes. Second, don’t be so hard on yourself. You’re not doing it wrong; being a Christian in this world, much less a Christian parent, is supposed to be hard! Even when you might think differently, know that you ARE worthy enough to share your faith with others. Jason Isbell has been married to Kim for almost 14 years and they have two sons: Maddox, 9, and Griffin, 6. Read 588 times	| Like this? Tweet it to your followers!